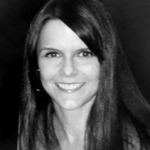 How long have you been studying English grammar? Last week on the blog, we highlighted the two uses of the present perfect tense. This week we’ll continue focusing on this common verb tense by comparing it with the present perfect progressive. It’s important that English language learners realize that there are two distinct uses of the present perfect (finished past action vs. continuing action). For continuing actions, both the present perfect and present perfect progressive are common, and this can be confusing for students. To clear up this confusion, try presenting these two tenses using the method below, which focuses on shorter time frames (within one day) and longer time frames (days, weeks, months, or years). For a comparison of the present perfect and the simple past, see our Present Perfect: Two Uses post. For short-term continuing actions (in the first chart), the -ing form is a lot more common. For example, it sounds much better to say He has been writing his report for two hours than He has written his report for two hours. 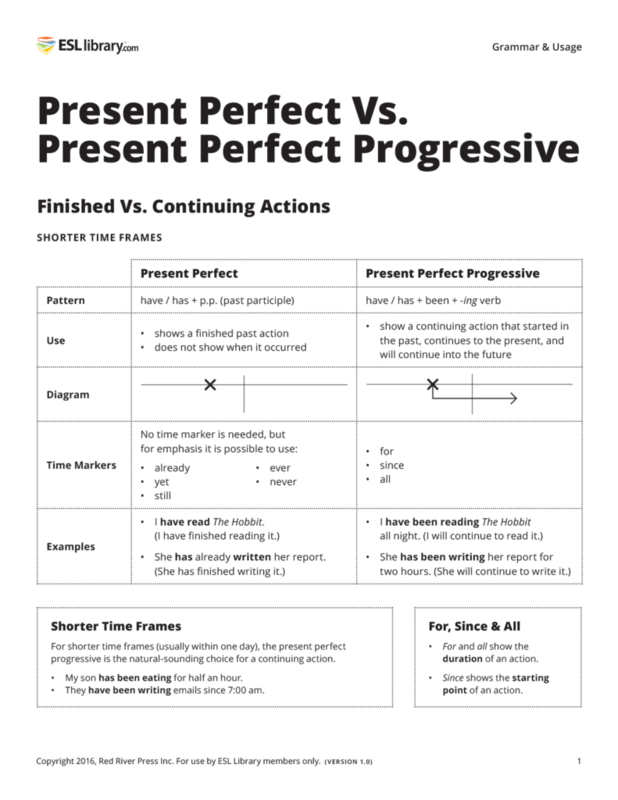 For longer time frames, the present perfect and present perfect progressive can be confusing because they are so similar. 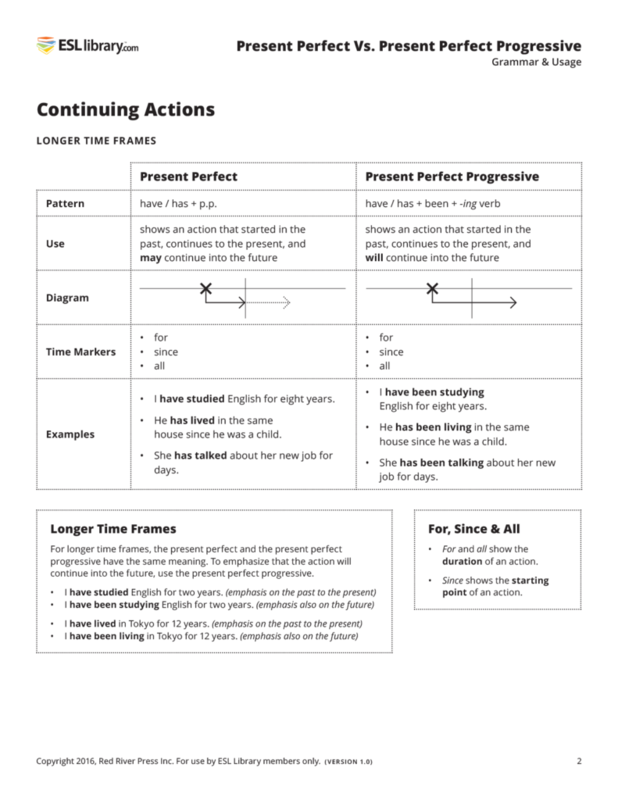 But in most cases, there is no difference in meaning between a long, continuing action using the present perfect and one using the present perfect progressive, so students can use whichever tense they want—both are likely correct. Students will undoubtedly ask you which tense is the better one to use for longer time frames. Point out that native speakers usually prefer the present perfect because it is shorter, but they will use the present perfect progressive when they really want to emphasize that an action will continue into the future. For instance, native speakers would more likely say I have lived in Vancouver for five years than I have been living in Vancouver for five years, though both are correct. In a job interview, though, when discussing their work experience, native speakers would likely say I have been working with children for eight years to emphasize that they will continue to do so (though, again, I have worked with children for eight years is also correct). Most importantly, make sure you reinforce that the present perfect (have + p.p.) can be used for a continuing action, not just a completed past action. Students often have trouble remembering this since all other continuous tenses in English use an -ing verb. Also, some textbooks only focus on the finished action use and don’t mention the continuing use of the present perfect, but it is very common and should be taught. Like almost all grammar rules in English, there are other cases and exceptions to the basic rules mentioned in this post. For example, It has been raining can indicate that the rain recently stopped, which is technically a finished past action. Going over every exception would likely overwhelm your students, though, so I suggest dealing with exceptions on a case-by-case basis if they come up in a lesson. Boss to secretary: ” what have you been doing all morning? Boss: How many have you typed? Hope this example helps . Excellent contextual example! Thanks for sharing, Mary. I’ve been wondering about the following the statement “I have lived in XXXX” and what it really means. If someone told me they “lived in XXXX,” I would instinctively ask them when (and also most probably, if they currently live there). Interestingly, if a “for XXXX” was added to the statement, it would instantly give the feeling that the person saying it is still living there. Any comments or thoughts on this would be greatly appreciated. Great question! If you just want to convey where you live now (without a time marker than tells someone how long you’ve lived there), the simple present is the most natural, common choice. – I’ve lived in Canada, New Zealand, and the Netherlands. With a time marker, both are possible, though the present perfect progressive is probably a little more common (it’s natural to want to emphasize we’re still living in that place). – I lived in Canada in 2015.